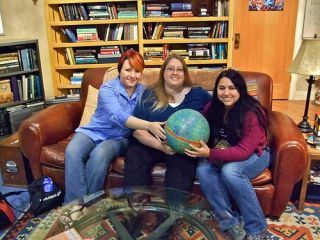 The NASA Team on the set of “The Big Bang Theory” holding the WMAP ball. From left to right: Sara Mitchell, Sarah Eyermann, Maggie Masetti. A NASA team recently dropped by the set of "The Big Bang Theory," a popular CBS sitcom about geeky astrophysicists. The NASA reps weren't checking up on the show's scientific accuracy — they just wanted to see their beach ball. NASA had developed the ball as an educational tool. It's adorned with data from the Wilkinson Microwave Anisotropy Probe (WMAP), which measures the temperature of the radiation left over from the Big Bang — the explosive event that formed the universe. The data from WMAP created a map of these temperature fluctuations over the entire sky, and that map is now covering the globe of the beach ball. "Imagine yourself at the center of this ball, looking in all directions," said the ball's designer, Britt Griswold, a graphics specialist at NASA's Goddard Space Flight Center in Greenbelt, Md. "What you are seeing is the first visible light in the universe. It has been stretched by the very fabric of space/time as the universe has expanded so it now is microwave light, invisible to our eyes — but not WMAP's telescopes." In August, public-outreach folks at Goddard started working on a story about the use of the beach ball as a teaching tool. They asked a producer of "The Big Bang Theory" for a photo of the ball on the show's set, and he invited them to come take the picture themselves. A few weeks later, the NASA team dropped by the set in Los Angeles. Waiting for them on the couch — in the spot where the character Sheldon always sits — was the WMAP beach ball. The set was also packed with other astro-nerd paraphernalia: old scientific instruments, bookshelves full of science tomes, and a whiteboard covered in scribbled equations and diagrams. The NASA team enjoyed going behind the scenes of "The Big Bang Theory" and seeing how a show about fictional scientists is put together, officials of the space agency said. As a thank you, the NASA reps brought with them a variety of goodies, including a scale model of the James Webb Space Telescope, currently under development to become a powerful successor to the Hubble Space Telescope. Also among the gifts was a special beach ball containing the latest WMAP data — and the signature of astrophysicist John Mather, who, with fellow scientist George Smoot, won the Nobel Prize for their work on this first light in the universe and its relationship to the Big Bang. The sitcom showed its appreciation by showing these gifts on the air. In the Nov. 4 episode, the Webb telescope model, plus some stickers, magnets and a poster, decorate the apartment of astrophysicist character Rajesh Koothrappali. The beach ball, for its part, still rests on the shelf behind Leonard and Sheldon's couch.